The bold, crow-sized pileated woodpecker is the largest woodpecker in North America, and one of the largest woodpecker species in the world. Markings: Dimorphic species. Males are solid black though the underparts may appear dark gray. Cheeks and throat are marked with thick black and white stripes and a white line continues down the bird's side. The vibrant red crest extends from the forehead to the nape, and the mustache is a darker red but may appear black in poor light. Females have the same markings but a black mustache and forehead, and their red crest are shorter and less brilliant. Both genders show large white underwing patches in flight and have black legs and feet. Juvenile birds look similar to adult females. Pileated woodpeckers inhabit old forests with large trees throughout the boreal region of central Canada and the Pacific Northwest as far south as northern California. Deciduous or mixed deciduous-coniferous forests are preferred. Their range extends through the eastern United States from Minnesota, Iowa and the eastern portions of Kansas, Oklahoma, and Texas to the Atlantic coast. Because these large woodpeckers rely on large, mature trees for suitable habitat, they are absent from plains areas and grasslands. They can be found in suburban and park settings where suitable trees are found. Pileated woodpeckers do not migrate. While these birds do not sing, their loud, rapid "kuk-kuk-kuk-kuk-kuk" calls are just as distinctive and slightly accelerate toward the end of the call. The drumming of pileated woodpeckers is relatively slow and even, but also accelerates near the end of each sequence. There are long gaps between bursts of drumming. 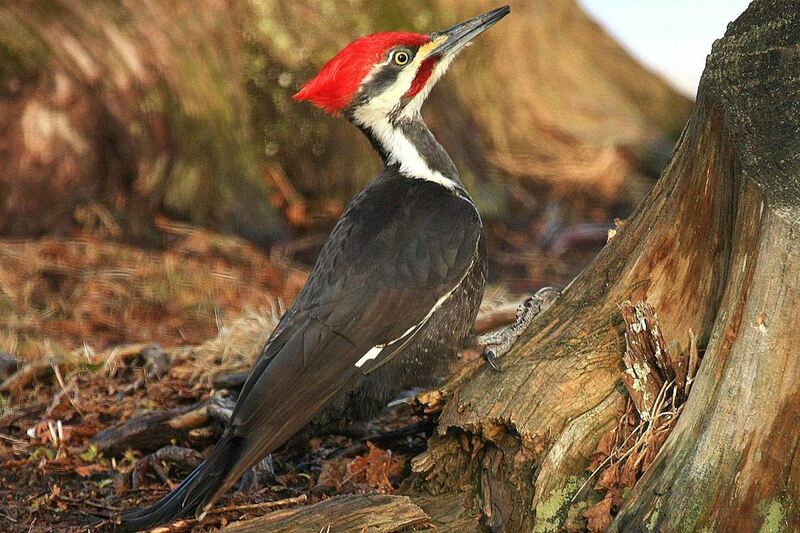 The pileated woodpecker is a solitary bird but can be found in pairs, especially during the breeding season. These birds will defend the same territory throughout the year but are more tolerant of other woodpeckers in the winter. When foraging, they will use their powerful bills to bore deep, rectangular holes or peel off strips of bark in search of insects, and they will feed on large trees as well as fallen logs. Pileated woodpeckers may even occasionally feed on the ground. Their flight pattern is an undulating line with short glides when the wings are pulled in to the body. Their bright red crest is mobile and may be raised or lowered to show different emotions or moods. These are monogamous birds. As cavity-nesters, they excavate a suitable cavity 10 to 24 inches deep in a dead tree. The nesting cavity has an elongated opening 15 to 85 feet above the ground, and the birds may leave a few wood chips inside for lining. The oval- or elliptical-shaped eggs are plain white with a subtle glossy finish. The male parent will do most of the 16 to 18 days of necessary incubation. Both parents care for the altricial young for 26 to 28 days after hatching, and a mated pair will raise one brood of 2 to 8 eggs each year. Young pileated woodpeckers remain close to their parents in a loose family group for several months but will seek out their own mates and territories at the beginning of the next breeding season. These woodpeckers tend to be shy but will come to backyards with sufficient large trees and where suet or nuts are offered. Backyard birders should leave old trees or fallen logs in place to attract foraging birds. Minimizing pesticide use will also help ensure a good supply of insects for pileated woodpeckers to find. While these woodpeckers are not considered threatened or endangered, their solitary nature makes them more susceptible to habitat loss, especially when mature forests are cleared or dead trees are removed from landscapes. Protecting suitable habitat is essential to protect pileated woodpeckers. Furthermore, because many other birds such as cavity-nesting ducks, swifts and owls will reuse the nests of pileated woodpeckers, protecting these birds can help many other species at the same time. Similarly, some wrens and smaller woodpeckers may also visit pileated woodpecker foraging locations when feeding.